Peter Tristram, 11/10. 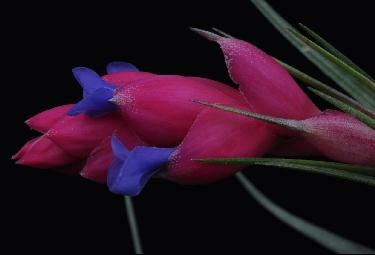 aeranthos x polzii now T. Holm's Azurite. Peter Tristram, 06/15. 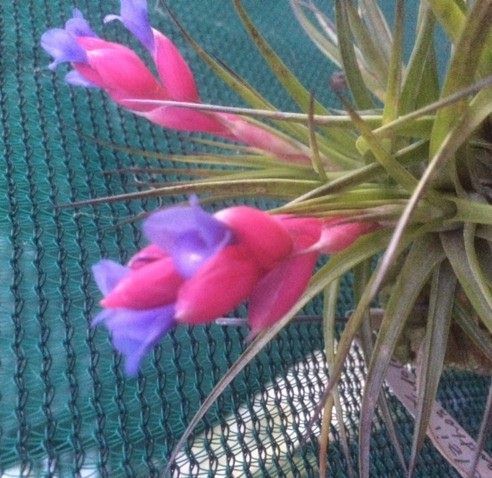 polzii x aeranthos now T. Holm's Azurite. Peter Tristram. T.aeranthos x polzii for comparison (see polzii page)... Here are a couple more of Holm’s hybrids (Deutschland). This aeranthos x polzii (unregistered)hybrid is new to my collection. Both are very attractive and a good addition to the growing pool of mongrels. 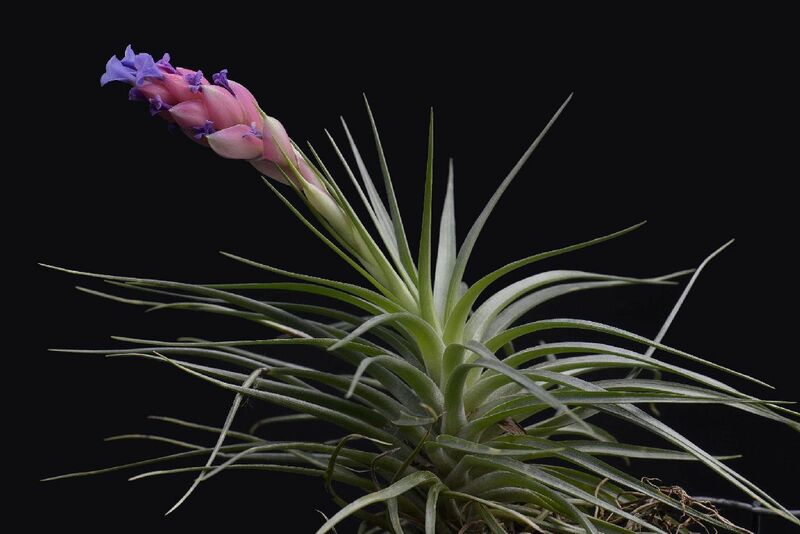 Quite a few others are budding, with some pretty unusual parentages or part unknown. The cold nights are slowing things down though. Peter Tristram, 01/17. 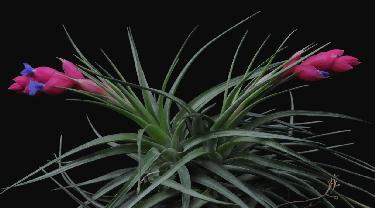 aeranthos x polzii unregistered hybrid. See notes below. 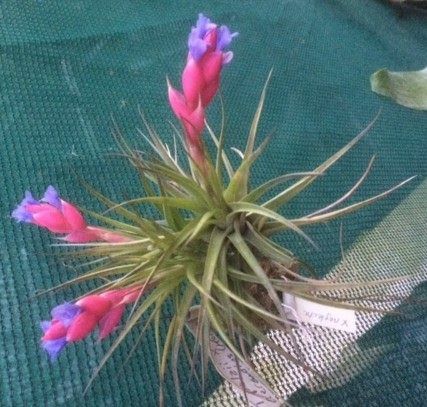 Peter Tristram ... "(polzii x aeranthos) I almost missed this one - last flowers. Burkhard has T. bella (which I purchased from him as polzii so it is actually likely to be bella x aeranthos. I don't remember seeing polzii. This makes sense given the size of the flowers and the deep greenness and general shape of the leaves. How about we name it T. Holm's Belle, or Holm's Schöne but the umlaut could be an issue! Scherne?" Derek Butcher ... "Ian: We are still ironing out Holm's hybrids - see attached. The correct name is T. 'Azurite' Such are the problems of using formulas and changing them AND crossing species with species that are very similar." From BCR ... "Mature plant 12 cm high x 10 cm diameter The growth habit resembles T. aeranthos, but the leaves are less densely arranged and more robust. The dark pink-bracted inflorescence on a slightly curved peduncle is globular and bears spirally- arranged , big mauve flowers. The seed parent T. bella was originally quoted (in error) as T. polzii. This same cultivar has been grown in Australia (in error) as T. 'Holm's Belle'. Reg. Doc. 1/2016 by Tanja Richter. Country of origin: Germany." Ed. caput-medusa x flabellata now ‘Holm’s Darling’, was ‘Papa’s Leibling’ (German for same thing) in early imports. streptocarpa ‘Alba’ x ‘Alba’ Really a selfing of a white petalled form of the sp. Suggest progeny will be closer to blue petals. Not worth registering unless something startling.